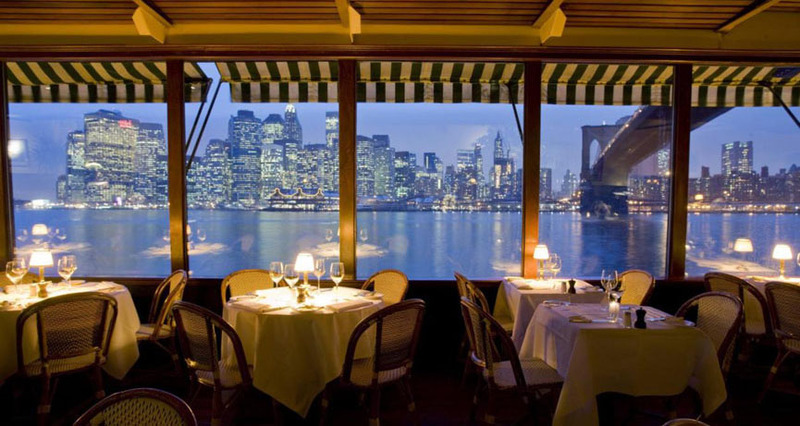 When Hurricane Sandy barreled down on New York City’s waterfront, it destroyed the River Café. After it hit the moored barge, the storm carried away the Cafe’s stash of priceless wines, plants, rattan chairs, mirrors, pots and pans. Whatever was not washed away was hopelessly damaged. Michael (Buzzy to everyone) O’Keeffe founded the restaurant in 1977 and it rapidly acquired landmark status. It was everyone’s favorite restaurant, and I became a devotee after I moved to Brooklyn Heights in 1994. In 2012, I mourned its loss as I still mourn that of the Twin Towers’ Windows on the World restaurant, vaporized during the 9/11 terrorist attack. Both eateries capitalized on the breathtaking views of New York City, one from the ground up, the other from the sky down. Hard work, patience, good will and millions of dollars later, the River Café is whole again. It might have been tempting to change decor, but O’Keeffe decided to restore the café to its former glory. On our anniversary, my husband and I strolled down the hill from our apartment in Brooklyn Heights and entered an unchanged vestibule filled with massive potted plants and flowers: daisies, azaleas, and blooming branches of quince. We passed over the well-draped bridge that anchors the barge to the shore and entered the seemingly unchanged, festive dining room with its small tables sporting shaded lamps, sweetheart bouquets, gleaming glasses and dinnerware. The maître d’ greeted us as if he had seen us recently, and everybody congratulated us on our anniversary. More important even than the décor was the ambiance of the restaurant and the non-snooty attitude of the staff, eighty percent of whom returned after a forced absence of eighteen months. Returning chef Brad Steelman’s food was delicious. To start I ordered a duo of foie gras, served with toasted slices of brioche, a translucent slice of apple and quince paste. My husband opted for Kobe beef tartare that the waiter mixed at the table with the raw yolk of a quail egg and the customary finely minced scallions, mustard, and capers. For main course I choose the sea bass, roasted to perfection and paired with artichoke ravioli. My long-time spouse had the equally perfect duck breast, served with sweet potato spaetzle—an Austrian type of gnocchi. The dessert choices included the restaurant’s famous chocolate Brooklyn Bridge, though we opted for the pistachio semi-freddo served on a bed of meringue and a warm chocolate soufflé. Perfect as the meal was, it was overshadowed by the view. When we came, the sun was still high, illuminating the Manhattan skyline, with the brave new Freedom Tower declaring that New York would not be defeated. Ferries plied the shimmering waters of the East River and gulls drifted on the wind. Looking south, Lady Liberty clutched her torch, and to the north, way above us, we saw the underbelly of the Brooklyn Bridge. As the sun set, the sky turned pink and the clouds darkened. As the evening progressed, thousands of lights pierced the now-blackened skyscrapers. As we were creeping back up the hill we had descended so lightly three hours earlier, I wished upon the evening star for a minimum of natural and human-made catastrophes. Given the inevitability of the climate change and the constancy of rattling guns, my request may be futile. 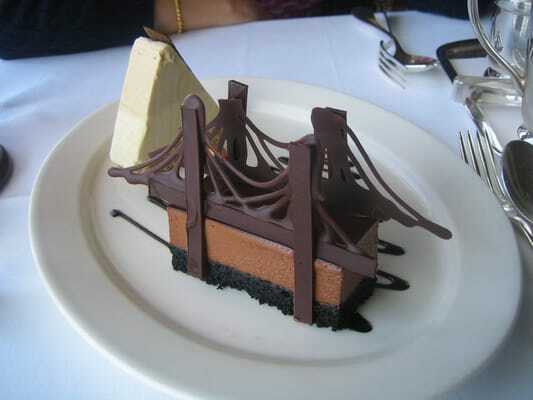 This entry was posted in Uncategorized and tagged anniversary, brad steelman, brooklyn, brooklyn bridge, brooklyn heights, buzzy o'keeffe, dining out, dumbo, family, fine dining, food, foodies, freedom tower, hurricane sandy, michael buzzy o'keeffe, new york city, nyc restaurants, restaurant reviews, restaurants, river cafe, twin towers, windows on the world. Bookmark the permalink.